‘Shil il ham’, I’m just wishing you happiness, delights, hope and good spirits as this Arabic phrase means “smell the scent of Jasmine and forget your troubles”. Admired for its absolute elegance and transfixing fragrance, Jasmine is always the sweetest and the most valuable flower in the garden of nature. Scientifically known as Jasminum Grandiflorum, this royal Jasmine variety blooms during the day and transforms its fragrant essence throughout the daylight hours. Jasmine Grandiflora is known as Jati in Sanskrit and is used in Ayurveda for numerous centuries in the treatment of cancer, ulcer, dysmennorhea, labor pain, migraine, wounds, skin infections, odontalgia, paralysis, depression, flatulence, venomous bites, insomnia and reproductive problems. Jasmine essential oil is extracted by solvent extraction method from the flowers and is also known to the world by other popular names like Royal Jasmine, Spanish Jasmine, Catalonian Jasmine and Pichcha. In the traditional Ayurvedic medicine, the decoction extracted from the leaves of Jasmine Grandiflora plant is used in treating toothache, poisonous insect stings and venomous snake bites. The cold infusion of the flower buds is used as a natural eye wash for relieving irritation and burning sensation in the eyes. Jasmine has been used in the Traditional Chinese Medicine as an effective aphrodisiac and as a natural aid for treating depression and promoting relaxation. The flowers, leaves and roots of Jasmine Grandiflora has been used a popular substitute to standard western medicine in the treatment of bone cancer, breast cancer, malignant tumors in the lymph nodes, anxiety, stress and depression. It is also used in treating respiratory problems, skin diseases and as an assistance during child birth and menstrual difficulties. Fresh Jasmine blossoms are used in making ornamental wreaths for hair, garlands and as religious offerings to God and Goddesses in the Hindu religion. These aromatic flowers are also used in making perfumes, attars and aromatic hair oils to maintain hair health and retain its natural fragrance. Jasmine essential oil has emmenagogue, diuretic, anticancer, stimulant, vermifuge, astringent, deobstruent, tonic, emollient, aphrodisiac, thermogenic, depurative, anthelmintic, suppurative, anodyne, antidepressant, neurasthenia and dentifrice properties. It takes about 7.6 million Jasmine flowers to extract 1 kg Jasmine essential oil. The major chemical constituents of Jasmine essential oil are methyl jasmonate, benzyl acetate, jasmone, linalyl acetate, benzyl alcohol, linalool, indol and phenylacetic acid. Ayurveda aims at longevity through healthy aging and prevention of illnesses by living a modest life with disciplined lifestyle by practicing an Ayurvedic routine, yoga, simple physical exercises, meditation, prayers and the use of herbs and essential oils in case of ill health. Ayurveda believes that everything is a part of nature and illnesses occur when human beings are against the rhythm of nature. Every individual is regarded as a unique part of nature and should be treated in a unique manner even for the same disease according to Ayurveda. Just like our thumb impression, each one of us has a distinct individual constitution that is made up of three biological energies known as doshas. They are vata, pitta and kapha. Every human being is embraced of these three doshas in different forms with the predominance of any one of these biological energies. Health according to Ayurveda is a perfect balance between these doshas and dosha imbalances cause sickness. Ayurvedic remedies work in a physical, psychosomatic and spiritual perspective and aim at striking balance between these doshas. Jasmine Grandiflora essential oil is said to treat vitiated vata conditions and pacify pitta and kapha doshas. This oil has bitter, astringent, cool, light and dry properties that act on the reproductive, bone, plasma and nerve tissues through the circulatory, nervous and reproductive channels. Gently applying 2 drops of Jasmine oil blended with 1 ml Olive oil helps in balancing the secretion of sebum in the skin, support sensitive skin, and heal inflamed and aggravated skin. The cicatrisant property of this oil promotes the growth of new cells and shore up cellular regeneration. By this way this aromatic blend helps in diminishing scars, stretch marks, blemishes and marks left by pimples and boils. Adding 1 drop of Jasmine oil to your bathing water is a great idea to nourish and protect your skin health everyday. 2 drops of Jasmine Grandiflora oil added to steam inhalation or vaporizer or warm bathing water aids in eliminating excess phlegm and mucus deposits in the lungs, chest and the nasal passages. Being an expectorant, Jasmine essential oil assists in treating cold, cough, sore throat, laryngitis, sinusitis, bronchitis, chest congestion, hoarse throats and nasal congestion. Every woman passes through a number of complex stages in her life cycle and the most important among them are menstrual problems like dysmennorhea, amenorrhea and blocked menstruation, pregnancy, childbirth, postpartum blues and menopausal syndromes. This is mainly attributed to its affinity to the blood and reproductive tissues that move towards the uterus. 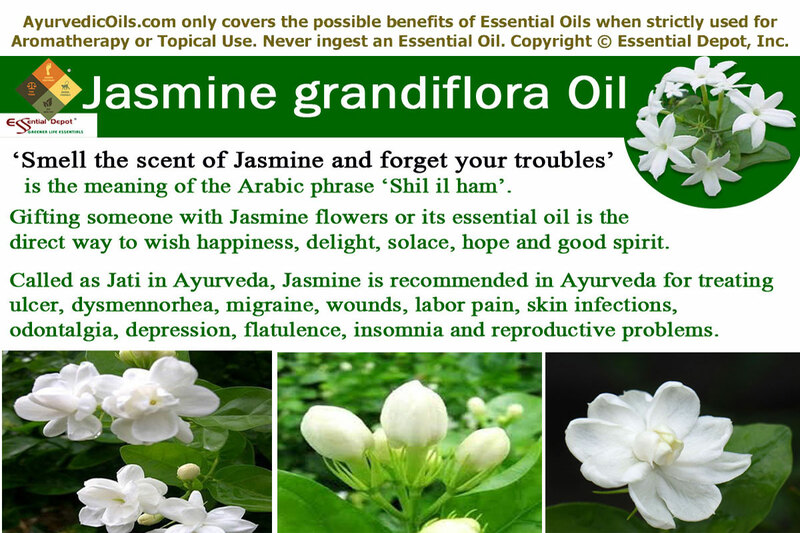 Jasmine Grandiflora essential oil acts as one among the best natural remedies for supporting womanly problems. This oil acts as an effective emmenagogue that helps in relieving dysmennorhea or menstrual pain, promote blocked or delayed menstruation and reduce other discomforts like nausea, fatigue, loss of temper etc, by pacifying the nerves and soothing the system. Blend 2 drops of Jasmine Grandiflora essential oil with 1 ml of sesame oil and massage it on your lower abdomen for immediate relief. Being a uterine tonic as well as a parturient, Jasmine Grandiflora essential oil augments contractions, promote relaxation and lessen the severity of pain during labor. Massaging the lower abdomen and back with 4 drops of Jasmine oil mixed with 2 ml of Jojoba oil before childbirth can help in passing through a peaceful delivery as well as a painless post-natal recovery. With its calming, cooling, soothing and anti-depressant properties, Jasmine essential oil can work wonders in treating postpartum depression and marks left behind by pregnancy including stretch marks. You can use it as a massage blend or in your diffuser or bath (2 drops of Jasmine oil) for overcoming post-delivery blues. “The fragrance diminishes fear; it is helpful in enhancing self confidence and defeating pessimism. No other oil is quite as capable of changing our mood so intensely. It offers little choice other than optimism,” says Susanne Fischer-Rizzi about Jasmine essential oil. 3 to 4 drops of Jasmine Grandiflora oil added to warm bath before going to bed can help in alleviating emotional strains, mental depression, fatigue, fear, lack of self confidence and negative feelings. Associated directly to the heart chakra, the caressing aroma of Jasmine oil acts a savior from the defensive feelings of life. It boosts confidence, soothes the nerves, balances feelings, restores positive energy and spreads the magic of selfless love all around. The soothing and cooling effects of this oil suits enormously well for kapha and pitta based depression. Adding 2 drops of Jasmine oil to burner, diffuser or aromatic candles can help in treating insomnia, dreadful dreams, restlessness and feelings of insecurity. Jasmine Grandiflora essential oil is a tremendous digestive aid that helps in treating flatulence, constipation, stomatitis, ulcers, ulcerative stomatitis and certain other digestive disorders. The ability to treat vitiated pitta helps control the secret of gastric acids and digestive juices in the stomach. The cooling and wound-healing properties of this oil assist in healing the ulcerous wounds in the lining of the stomach and intestines. Mix 2 drops of Jasmine oil with 1 ml of sesame oil and massage it gently on the stomach and abdomen for stimulating bowel movements and assisting other digestive problems. A study on the “Evaluation of Anti-Ulcer Potential of Leaves of Jasminum Grandiflorum L by the SGSPS Institute of Pharmacy, India have proved that Jasmine leaves have anti-ulcer effect that helps in treating peptic ulcer, wounds, ulcerative stomatitis, corns, ulcers etc. This study also insists on the use of Jasmine leaves in folk medicine for treating various ulcers and similar stomachic conditions. A 2007 study on “Antiulcer and in vitro antioxidant activities of Jasminum grandiflorum leaves L.” concluded that the leaves of Jasmine Grandiflora plant possess free-radical scavenging abilities and anti-ulcer activities that make it a promising traditional medicine for treating acute gastric ulcer, ulcerative stomatitis and certain other health conditions. Jasminum Grandiflora essential oil is also used in treating leprosy, corns, ottorrhoea, rectal bleeding, uterine problems, urinary infections, paralysis, mental debility, giddiness, cirrhosis, hepatitis and many other health problems. This article is only for the purpose of information and is not directed to diagnose or substitute any prescribed medication or professional medical advice. Never take essential oils internally and always remember to use them in a diluted form as pure and organic essential oils are concentrated liquids and may cause harm if used directly on skin. Keep out of reach of children and be cautious if you are pregnant as Jasmine essential oil has emmenagogue properties that promote menstruation. Consult your Ayurvedic Practitioner before using the suitable essential oils for your unique individual constitution and state of health. This entry was posted in Essential Oils - Learn About and Purchase and tagged Ayurveda for dysmennorhea, Ayurvedic health benefits of Jasmine Grandiflora oil, Ayurvedic oils for cancer, Ayurvedic oils for childbirth, Ayurvedic oils for depression, Ayurvedic oils for insect bites, Ayurvedic oils for insomnia, Ayurvedic oils for labor pain, Ayurvedic oils for menstrual problems, Ayurvedic oils for respiratory problems, Ayurvedic oils for skin care, Ayurvedic oils for ulcer, Ayurvedic oils for wounds, Ayurvedic remedies for depression, Chemical constituents of Jasmine Grandiflora oil, Health benefits of Jasmine Grandiflora oil, Jasmine essential oil, Jasmine Grandiflora in Ayurveda, Jasminum Grandiflorum, Therapeutic properties of Jasmine Grandiflora oil by AyurvedicOils. Bookmark the permalink.